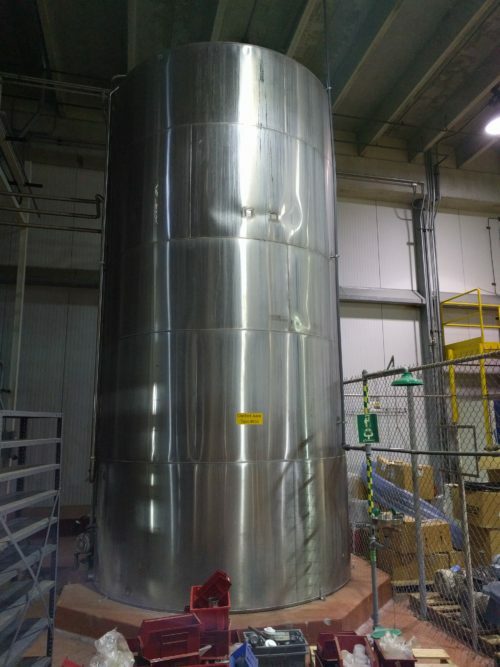 Small 7000 Gallon Storage Silo – Frain Industries, Inc.
Industries like mining, pharmaceuticals, agriculture, chemical engineering, and more all deal with large volumes of bulk material on a regular basis. Silos are built in many different sizes, but they are typically very tall so that they can house large quantities of bulk material. A silo has an access point on the top through which new material can be inserted, and then an exit valve on the bottom where material can leave using gravity, an auger, or even a pneumatic conveying system. Most silos are built with a cone shape on the bottom to make it easier to control the flow of material as it leaves and is sent onto a belt or into a pneumatic system. If the bulk material handling system uses a pneumatic conveyor, the conveyor tube can be attached directly to the lower portion of the silo. In large industrial settings where high volumes of material are stored and processed, a series of silos may all be integrated into the same system. A silo can be built using a variety of materials, but the most common type is built using large sheets of steel that are ribbed on the inside to prevent material from sticking and building up on the walls over a long period of time. A silo can also be mounted on a raised frame with a high enough clearance that a dump truck can park beneath it and quickly accept a load. Dry bulk materials like gravel, coal, sand, cement, woodchips, and sawdust can all be stored in a silo. Flat-bottom silos are used for very high volume bulk storage and are fitted with some kind of mechanical or pneumatic reclaiming equipment to help slowly empty the silo. With a silo or series of silos on site, an industrial facility can securely store a very high volume of bulk materials for an extended period of time without compromising the quality of the material particles.